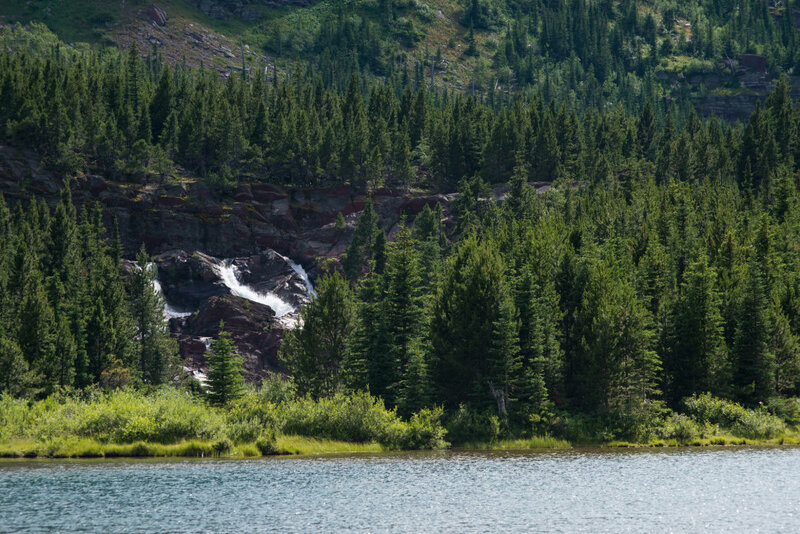 Hiking to a pristine backcountry lake is a classic summer adventure. 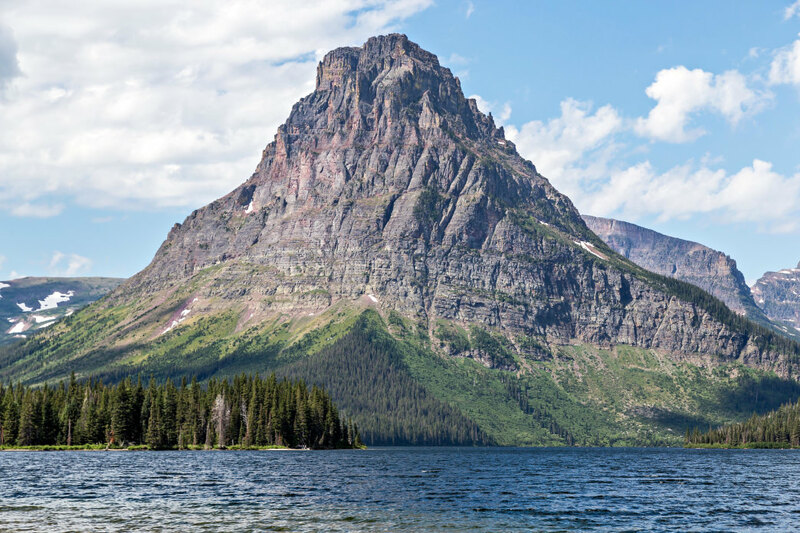 While many remote lakes in Glacier National Park beckon advanced hikers, there are a number of opportunities for those who want to experience clear water and beautiful scenery without the epic hike. Here's our rundown of some of the best, most accessible backcountry lakes in the park. The stroll through Trail of the Cedars is one of the most popular in the park, due to its quiet beauty and all-ages difficulty level. As a result, the greatest challenge here can be finding a parking spot, especially in July and August. We recommend taking advantage of the terrific (and free) shuttle system whenever possible. This hike begins on a wooden boardwalk that wanders for approximately a mile through a monumental old-growth cedar forest. Afterward, a junction leads to a brief climb, the steepest along the entire trail. Alongside, the waters of Avalanche Creek roar powerfully through the rocks below. Soon, the trail dives deeper into the shade of the forest. The beach at Avalanche Lake is a sight to behold. Waterfalls, some originating at Sperry Glacier, stream down the surrounding mountainsides. Wade in the cold water here, or fish for small (but feisty) cutthroat trout. As always, watch for grizzlies or black bears, and be sure to pack out any trash or food with you. 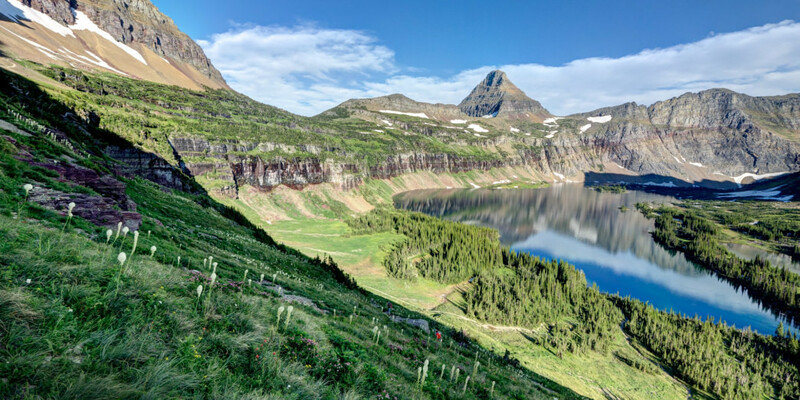 While the dramatic, cliff-hugging hike to Grinnell Glacier in the Many Glacier Valley is a favorite park visitors who wish to see a glacier up close before they disappear, the gentle walk to the surreal blue-green Grinnell Lake is no slouch. You won’t have to walk very far to feel immersed in wilderness. 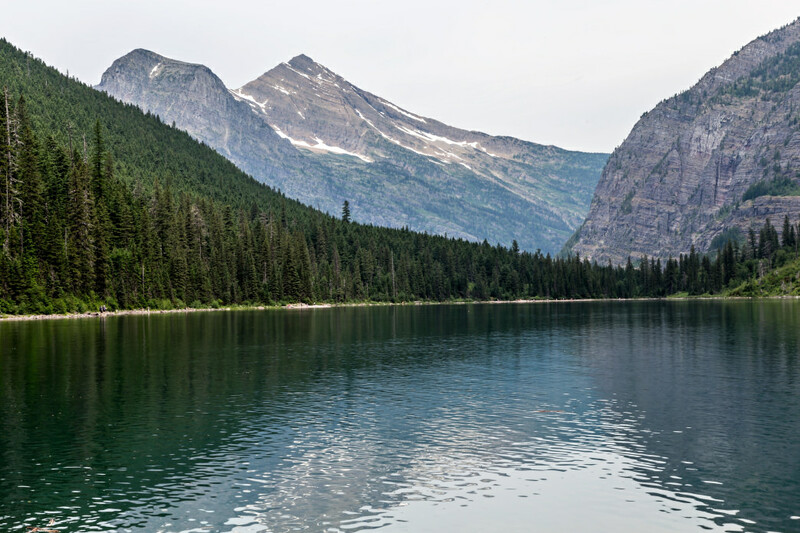 From the upper parking lot of the Many Glacier Hotel, you’ll start by hiking along Swiftcurrent Lake and into the forest. Bear grass blooms in the early summer, and thimbleberries soon follow. The bouncy suspension bridge over Cataract Creek is a highlight of this hike, and the hiking is never strenuous. Upon reaching the lake, the pebbled beach is a lovely spot to relax before heading back toward the car. This hike offers a bit more of a challenge, though it’s as popular (and can be as crowded) as the Avalanche Lake hike noted above. For the most part, the hike to the overlook is a gentle ascent, but the stretch of trail down to the lake drops 700 feet through a series of switchbacks. You’ll be cursing them on the way back up! Even though this trail starts on pavement, the area around Hidden Lake is wild country. Grizzlies are often found digging glacier lily bulbs early in the summer, when the sub-alpine meadows are blanketed in glorious yellow blooms, and there are times when the trail beyond the overlook is closed due to their presence. Bighorn sheep are frequent visitors, and mountain goats often share the trail. There have even been sightings of elusive wolverines. Aptly named, due to the actual icebergs floating in this insanely cold water, Iceberg Lake is another Glacier National Park classic. 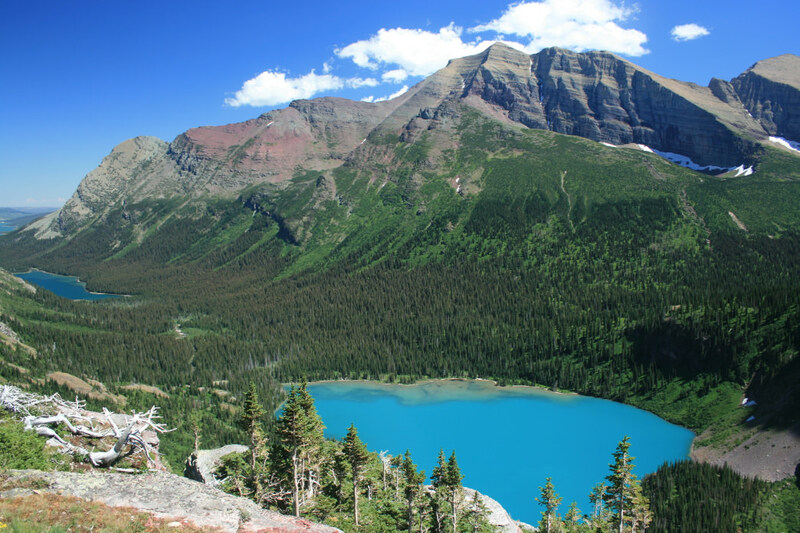 With stunning blue-green water, nestled in a high mountain cirque surrounded by rocky sentinels, it’s a must-do hike. The first quarter mile of this hike is the steepest. After a gradual climb past Ptarmigan Falls, the forest gives way to astounding views along the base of the Ptarmigan Wall. The subalpine meadows near the lake are often bursting with wildflowers, and moose sightings are common. You may find a crowd at the lake, but it’s possible to walk around to find a more secluded spot. A favorite tradition is to swim or wade to an iceberg, a bracing endeavor for anyone. This area is notorious grizzly bear habitat, particularly towards the end of the season when the huckleberries bordering the trail are ripe. This is one of the best hikes to go on when snow blankets the high country. 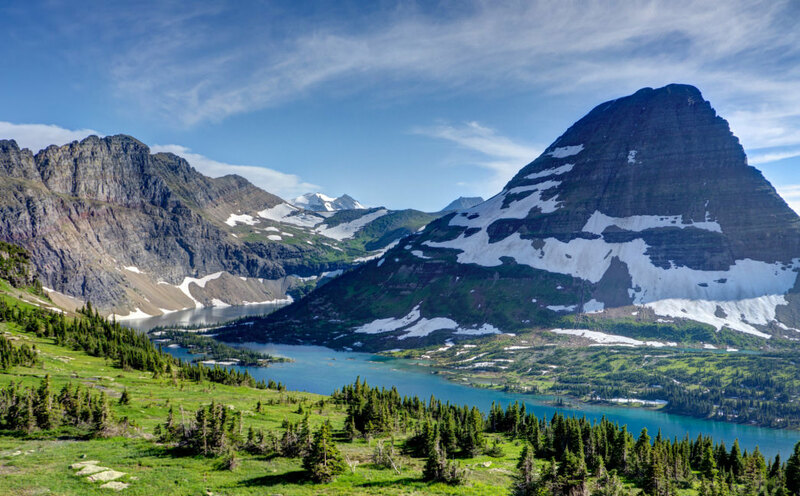 Begin at the trailhead to Swiftcurrent Pass in the Many Glacier Valley. A little more than a quarter-mile down the trail, you’ll notice the side trail to Fishercap Lake. Take it. Despite its proximity to the hustle and bustle of the campground and motor inn, Fishercap is a quiet space that frequently has moose feeding nearby. Returning from Fishercap, the trail travels through an aspen glen before thinning out. Huckleberries are common here in the summer. Less than a mile up the trail, the impressive Redrock Falls cascades downward, an ideal spot to spot water ousels or simply rest under the trees. The lake itself isn’t far above. The Two Medicine area isn’t as busy as others in the park, since it isn’t adjacent to the Going-to-the-Sun Road. It’s a beautiful region, though, with majestic peaks and plenty of hiking options. Upper Two Medicine is one of the better lakes in the park for trout fishing. Many hikers purchase a ticket and ride the boat across Lower Two Medicine Lake, picking up the trailhead on the other side. You may also skip the boat ride and walk around the north shore of the lake, adding another 4.8 miles of level hiking. The trail itself is dense with ferns and huckleberries. The short side trip to Twin Falls is worth the quick detour. 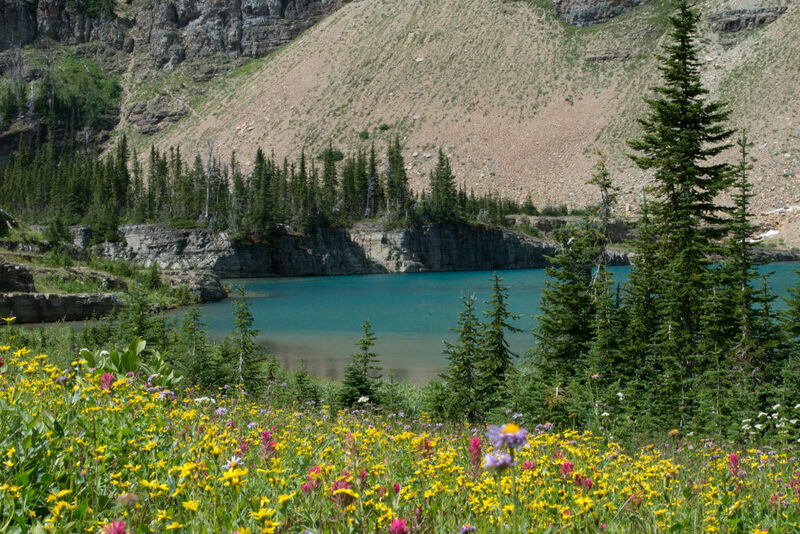 Just before the lake, you’ll emerge from the forest into a wildflower-packed meadow.There is a backcountry campsite near the lake, although you’ll have to obtain an overnight permit from the backcountry ranger station to camp there. 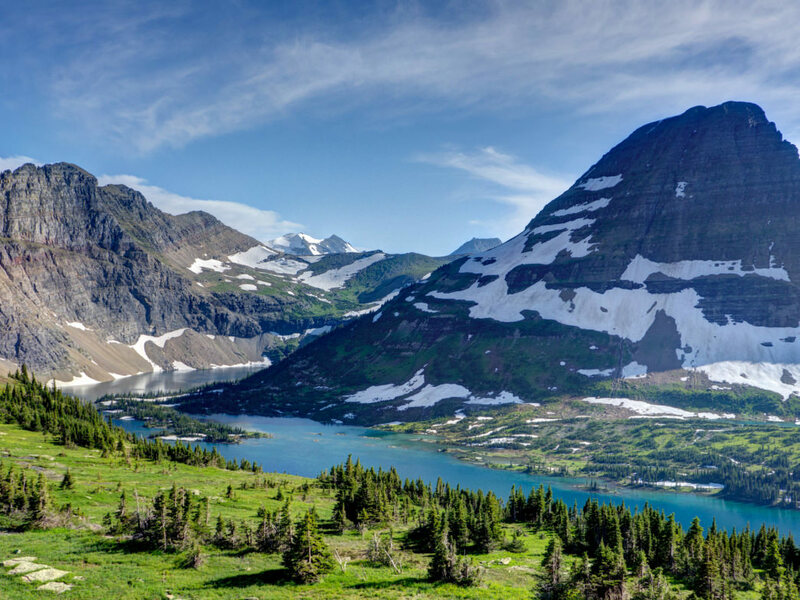 You don’t have to be gone for days to enjoy a backcountry lake in Glacier. Choose any of these easy hikes to create your own moment in the wild.